When we walk through a makeup store or shop online, there are multiple times where we go “Ooh! That’s such a pretty color!” and we immediately buy the product. Maybe it’s a bright pink lipstick or a shimmery silver shadow, but more often than not, the color ends up looking horrible on us. There’s a reason for this; it’s called color theory. Makeup is an art form, and just like with painting, knowing the color wheel is essential for a good application. 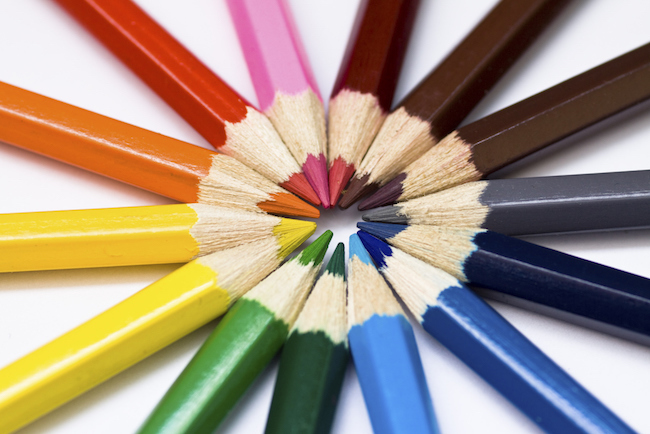 The second step of knowing the color wheel is understanding what colors complement each other. To do this, simply pick any color on the wheel and find the one directly opposite. For example: red and green, blue and orange, purple and yellow. Easy-peasy. So why does this matter? You’ll see. Choosing the right foundation shade. Everyone’s skin has an undertone: warm, neutral, or cool. There are a few ways to determine what skin tone you have. The easiest way is the vein test. Look at the veins on the underside of your wrist. Do they look blue? You’re “cool.” Green? You’re “warm.” Having a hard time discerning it? You’re “neutral.” Another way to figure our your skin tone is to look at your jewelry. Do you find you look better in gold? You’re “warm.” Silver? “Cool.” Both? “Neutral.” Determining your undertone is essential for choosing the right foundation shade, as they will usually lean more yellow for warm tones, and more pink for cool tones. Overall, understanding your undertone is the basis for choosing what other colors will look best on you. Sure, concealer is great, but there’s only so much it can do on its own. If you really want to cover that pesky pimple or conceal those undereye circles, you’ll need to correct the problem first. So, what does that mean? Correcting means to use a color opposite from the one of the problem in order to cancel it out. Remember complimentary colors? This is where they come in. Let’s say you have dark, blue-ish undereye circles. Since orange is the opposite of blue, you’ll want to use a peachy or orange toned corrector to cancel them out. Got a big red zit? You can use a green corrector to eliminate the redness before applying your regular concealer. Choosing the right blush color. Makeup is just makeup, and there are really no rules when it comes to it. But if you really want to make your face pop, then choosing the right blush color for your skin tone is essential. Like we went over before, knowing your undertone is crucial in choosing what colors will look best on you, so it’s best to stick to shades that also have the same undertone as your skin. So if you’re cool toned, cool pinks will look wonderful, while warmer toned skin looks excellent in peach or coral shades. Neutral? You can go either way! Undertones are also very important when choosing the right bronzer or contouring shade. A general rule of thumb: bronzers should be warm, to fake a natural tan, while contours should be cool, to mimic a natural shadow. The easiest way to make your eyes stand out is to use the right shades to complement your eye color. And what do you think you need to know to do this? Complimentary colors, yet again! Anything that contrasts your eye color will make it pop even more. So, if you have blue eyes, warm browns, coppers and bronzes will look amazing. Green and hazel eyes will make a huge statement in purples and rosy tones. And if you have brown eyes, you’re in luck! Any color will look absolutely stunning on you; but if you really want your eyes to be the focal point, try blues, purples, and golds. Choose the right lip color. Like we said before, there are no rules in makeup, so wear whatever color you like! But the color you do choose can seriously affect how you look. Wearing the wrong shade for your undertone can make you look sick, so we always suggest sticking to the colors that suit you well. You probably know what we’re about to say; colors that have the same undertone as you will always look more flattering. So if you’re “cool,” choose, for example, a blue-based red or fuchsia, or pinky nudes. Warmer skin tones will look great in corals, peachy nudes, and orange-based reds. If you have a deeper skin tone, you can get away with darker, brown-based reds, berry shades and plums.